For the theme of ‘arranged’, I almost went with a picture from when I saw the Changing of the Guard at Horseguards Parade last year, but in the end I thought this was a better fit – literally. These boats in Oxford are carefully arranged to fit them all together to moor them. 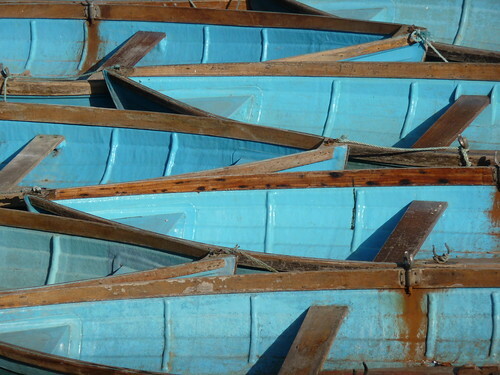 This entry was posted in Photography and tagged arranged, blue, boats, moored, moorings, oxford, weekly photo challenge. Bookmark the permalink. How very cool! This is a great picture – and a neat arrangement too! Thank you! I was pleased to have something which fit the challenge so well. Beautiful! Perfect shot for this weeks challenge! Gorgeous colour and perfectly arranged! I love the colour too. I also like the distressed, slightly unkempt look of the boats where the paint is coming away. It looks like they were built to fit together. Nice post. It does, doesn’t it! Convenient! Nice shot! The gunwales make an interesting pattern. Love this shot! Took me a bit to figure out what I was looking at! I like composition and colors in this!